Sonic confirmed for Super Smash Bros U! Yes, I am not crazy. Sonic the Hedgehog has been confirmed to be a playable character in the latest fighting game from Nintendo, Super Smash Bros. U/3DS! Woo, really need to take a breath from that. We have seen Sonic being in the third installment of this franchise, Super Smash Bros. Brawl. And like always, he was awesome. A lot of people were worried that Sonic wouldn't make the cut for the roster in the next game. But here I am, showing you that he will be playable. And by looking at the picture, you might have noticed another thing. Yes, even more crazy stuff, one of the stages will be Windy Hill! A great stage to also promote the soon to be released Sonic Lost World. Please click more to watch a trailer of the game containing Sonic. Super Smash Bros U/3DS will be released in 2014, exact date to be announced. Yes, that is correct! Two new gameplay trailers at once! Both Sonic Lost World and Mario and Sonic at the Sochi Olympic Winter Games 2014 got new trailers for their own games, shown at Nintendo Direct! The first one is a gameplay trailer of Lost World starring a narrator that makes me think of the pokemon narrator..... Uhh, let's move on! Unfortunately, the trailer doesn't show much things that we haven't seen yet. The second trailer is the most interesting. It not only shows gameplay, but also the first Animated Cutscene with the entire crew standing on a line preparing to start the events, even more events and the Legends Showdown! What's that you might ask? Legends Showdown is most likely another name for the Story of this game. As you can see, there are ''dark'' versions of the heroes, which are obviously the villains where you'll have to compete against in events. I think I'm forgetting something..... Oh right, ONLINE MULTIPLAYER!! Yes, that is correct, you can compete against people from all over the world in events! Isn't that awesome? It definitely is! Sonic Lost World: More pre-order Bonuses! The UK version will get the Golden Omochao , which will help you throughout the stage (Hopefully in a good way), and 5 Black Bomb Color Powers , which will allow Sonic to transform into the Black Bomb . Please note that the Black Bomb has to be unlocked in the NiGHTS DLC. 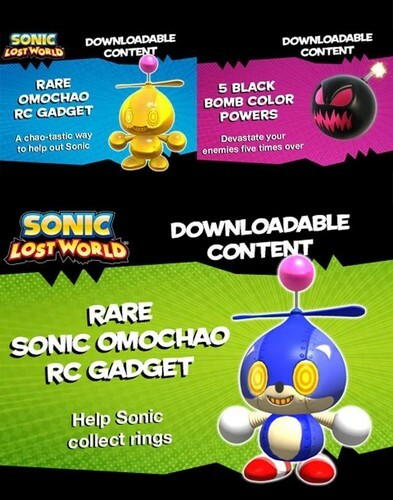 The US version will get the Sonic Omochao , which will help Sonic collect rings. I am not aware what the pre-order bonuses will be for other countries, apart from the NiGHTS DLC. Whenever this info is release, I'll let you know. Sonic Dash Global Challenge: Unlock Blaze! 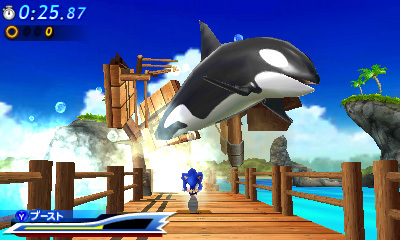 From the somewhat bad news concerning Sonic Lost World, we now gained access to a very interesting piece of new stuff. That's correct, there is another global challenge heading your way in Sonic Dash! And this time, you'll have the ability to unlock Blaze the Cat! Excited? I am for sure. This time, instead of making 100 laps around the world, we have been gained a new goal. People from all around the world are now being asked to get the best scores out there. You'll have to reach a combined goal, but also a personal goal. Sounds difficult? Well, it's not called a challenge for nothing is it? The Global Challenge will run until the 6th of October, so keep running and dashing! Together, we can do it! In the last two days, alot of news have popped up. To be honest, I am going to start with the bad news, to make you aware of what's going to happen before you want to buy the game. Sonic Lost World digital copies will take up alot of space. And with that I mean a huge amount of space. The 3DS version will take up an amount of 1,25GB. The Wii U version even goes more into extreme, with a whopping 8,37GB. For people who want to buy them digital, this is really awful news, as the 3ds usually contain 2GB memory cards, with the xl being 4GB. The Wii U isn't any better. Even more bad news for people who are wanting to buy the digital copy, it is not possible to get the deadly six expansion digital. It is only avaiable with Retail games. Extremely bad news for people who live in North-America, since the release date has been EXTENDED TILL THE 29TH OF OCTOBER! The other countries still got the same release dates. The good news... Click 'read more' to gain more information, including Another cutscene of the game! "There will be an Android version of Sonic Dash, we're just reviewing our release schedule to accommodate it, but you can expect an announcement very soon." Also, just yesterday the Android port of Sonic & SEGA All-Stars Racing appeared, which you can buy right now on Google Play. Today another trailer has been revealed at TGS, or rather said Tokyo Game Show. While the trailer is in Japanese, there is a huge chunk of gameplay and information avaiable for the viewers. This trailer focuses on many aspects, including New sections of stages, Various (Short) Cutscenes and Wii U/3DS differences. But we didn't came for that only did we? A character, which we have all known that was going to be in this game, has also received a short cutscene! Yes, I'm talking about Amy Rose! And she got a rather... Interesting cutscene surrounding her. No information on that cutscene yet, but it looks great nonetheless. And even more good news, only one more month till the game will finally be released! Well, if you live in Europe that is. North America will finally be able to play this game on the 22nd of October, while Japan has to wait even longer, till the 24th of october. Finally we get the game earlier than Japan hurray! Sonic Dash: New level update and more! Today Sonic Dash has received another massive update. This time, it is not a character. Not a global challenge. No, we got a new stage! Well, partly that is... It is still Seaside Hill but from a different point of view. This time, it is mainly focused on the beach part of the stage. Finally we can speed through something else than the same old stage being reused in every single game. There are also rumors going around, speaking of another Global Challenge including a new character! Those are still rumors though, so we will not go into much detail yet. We do know that later on Silver, Rouge, Cream and Blaze are planned for the game, so the possibility that one of those will be playable later on is big. EDIT: The global challenge has been confirmed! Also, this game allows iCloud support which makes you able to continue the game on any iOS devices and, thought not been shown in the video, the stage also takes you in underwater tubes similiar to the Seaside Hill racing stage from Sonic and Sega All-Stars Racing! Sonic Generations now avaiable in the 3DS E-shop! Sonic Generations , the game that has been released on the 3DS 2 years ago, is now avaiable in the e-shop! The now classic game brings you back to the Genesis days and the Modern days, by mixing both gameplay modes into one. Seeing familiar stages such as Green Hill zone, Emerald Coast and Tropical Resort , this game is a must have for Sonic fans of all time! It is now yours for $29,99 at the E-shop. Today, a new (Japanese) trailer for Sonic Lost World has been revealed! The trailer is called The Deadly Six Trailer. This is because the trailer shows the encounters with them. But what's so special this time? We are given new gameplay of the Boss Battles themselves!!! We have seen the first boss, Zazz, already various times. But this time, all of the members from the Deadly Six are shown in their respentative boss battles. From encountering them with a mech, or having a one-on-one battle, it's shown here!